How many times a day do you look at your teeth? Like most people, you probably check them out several times a day either to make sure there's no food stuck in between them or that they look healthy and bright. What fewer people do is check out their gums -- a habit that everyone can afford to adopt! Take a look at your gums now. Do they look like they're receding or do they feel extra sensitive lately? Have you ever suffered from bleeding gums or bad breath? If so, these are signs that you need a dental visit. Here's why: Gum recession may be a sign of gum disease. Left untreated, gum disease can lead to tooth loss and even heart disease. For early stages of gum disease, Dr. Wright can use a non-surgical gum disease treatment such as scaling and root planing (SRP) or laser dentistry to help maintain your smile. But excessive gum recession may require dental surgery. Exposed roots make your teeth more vulnerable to bacteria, cause tooth sensitivity and an uneven gum line. For excessive gum recession, we may recommend a gum grafting treatment. Attached gingiva and alveolar mucosa are the two types of gum tissues. Attached gingiva is -- surprise! -- attached to the tooth and underlying bone. It is immovable and fairly resistant to everyday trauma caused by eating and tooth brushing. Alveolar mucosa is the more delicate tissue of the two -- located beneath the attached gingiva, alveolar mucosa is loose and allows for movement of the lips and cheeks. 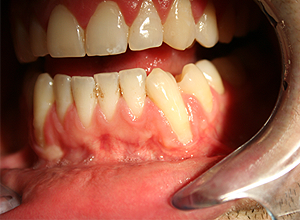 Unlike attached gingiva, alveolar mucosa cannot withstand "normal" trauma caused by eating and brushing. As mentioned earlier, receding gums can be traced to gum disease, but that's just one cause. Over time, brushing too aggressively can wear down your gums and cause them to recede. People who are born with naturally thin gingiva are most vulnerable to this. Orthodontic therapies can also stretch the gum line. A high frenum attachment can also trigger gum recession. The frenum is the muscle between the upper or lower front teeth; if it pulls on the gum margin, recession may result. Once your gums start to recede, brushing with a lighter hand will only be effective if there is still adequate gum tissue left to act as a barrier from disease and bone loss. But if your gums have receded to the extent that your alveolar mucosa or tooth roots are exposed, your periodontist may recommend a gum grafting treatment. Exposed tooth roots can cause varying degrees of tooth sensitivity or make your teeth appear longer than normal. But more importantly, exposed tooth roots can leave your teeth vulnerable to bacteria and periodontal disease. Gum grafting may be recommended to correct a high frenum attachment if the frenum is pulling on your gum margin. During this type of procedure, the frenum is surgically released and a new band of hard gum is added to re-establish the amount of attached gingiva required for support and movement. Sticking to regular dental visits is the only way to properly monitor the health of your gums. However, it's not a bad idea to examine them yourself on a regular basis. Just keep in mind that the goal is not to self-diagnose but to look for discoloration or recession because both are signs that you should schedule an appointment with us. And remember, while it's common to experience minor bleeding after brushing and flossing or to feel some tooth sensitivity after consuming hot or cold drinks, these can also be red flags for gum disease or gum recession.